Jon is traveling this week, which makes things hard, but this week is turning out to be exceptionally difficult. Gus, for the most part, has transitioned very well to his new preschool. I, on the other hand, am not faring as well. I don't get to speak with the teachers at pick-up, so I'm relying on Gus' account of his day. As you can imagine, 3-year-olds don't provide much detail, if any information at all. According to him he's not getting fruits/veggies at school because they're not being passed to him. How do I encourage him to ask to pass food when they're not foods that he would look at and say, "I want that!". We have begun practicing at home, but I'm not sure what's the best course of action to take. I want him to try all the foods that are being offered, but I don't trust that he will do that without reminders from the teacher. I emailed the teachers today, so we'll see if they have any advice to how best deal with my transitioning difficulties. I know that he is getting older and I can't control every minute of his day, but I want him to learn that he should try new foods, whether it's at home or school. Gus is much more vocal this trip about missing Jon. On Monday night Gus started crying because he thought that I was going to close the computer while they were video-chatting. Last night, Gus didn't want to say good-bye to Dad, and I think if I would have been okay with it, Gus would have preferred that I leave the computer on all night so that Jon could be with him while he slept. One of Gus' responses to Jon being gone is to take it out on me. So, he's not being as good of a listener as he can be (for a 3-year-old), which leads to me having to discipline him, which causes a tantrum. I hate feeling like I'm always the bad guy and I hate thinking that Gus is learning that I'm always angry. Yesterday he asked me, "Are you angry, mama?" "No, honey, I'm not angry, but I am upset that you're not listening." "I don't like it when you're angry." "Me, either." Broke my heart. 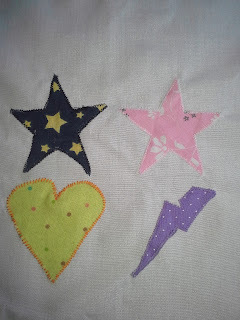 Our bereaved parent support group is making another quilt. This will be either the 5th or 6th quilt since it's beginnings 25 years ago. I have decided to make a quilt square, they're due on Thursday and it's not going well. I got the fabric, washed the fabric, cut the fabric pinned the fabric, sewed three of the patches and then hit the wall. I'm not so good on curves, so Tittle's heart gave me much frustration. I wanted the square to look professional, and after four attempts of sewing the curves of the heart, I gave up and decided to hand-sew it. I came to terms that the square was not going to turn out as I pictured it in my head, but I was pleased with myself for the great job that I did on the stars and lightning bolt. As I tied the knot after hand-stitching Tittle's heart, I saw that there were places on both Oscar's and Bella's starts that had come unsewn!!! I don't know if it's because the material frayed or if I missed the fabric while sewing on the machine, but I'm feeling really low right now that the square is going to look horrible. And, now I have to come up with some way to fix it that doesn't look like a total mess. As I type this two people I know are being induced to deliver their second rainbows. One person I know will be induced tomorrow with their first rainbow. One person I know just posted on facebook that they are now 37 weeks with their first rainbow and are ready to meet him. I'm so saddened. I'm so saddened that there is so much uncertainty with whether or not I will ever have a second rainbow. I'm saddened that I can't be happy for these people and that I have to numb myself to their news and excitement.